I sent you a number of my catalogues some months ago, but to date have received no order from you. 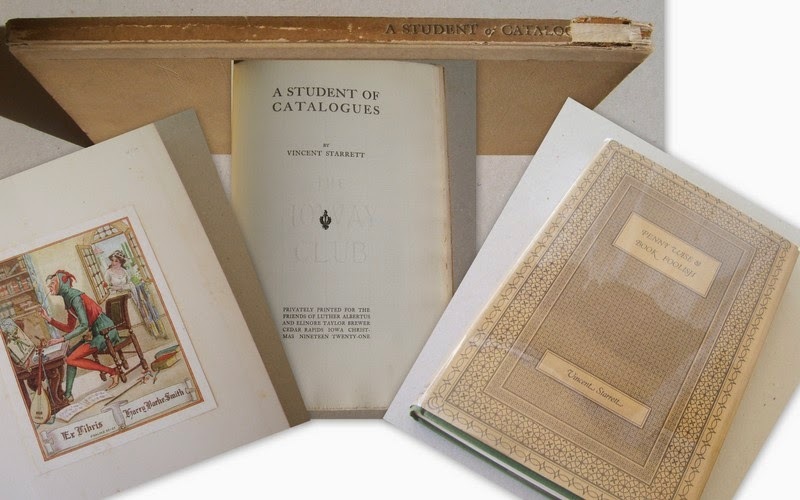 Are you a prospective purchaser, or merely a student of catalogues? In 1921, Vincent Starrett wrote about this incident in A Student of Catalogues, a piece which became the Torch Press Christmas book for that year. Two hundred and fifty copies were "privately printed for the friends of Luther Albertus and Elinore Taylor Brewer." Eight years later, Vincent Starrett included the piece in his own book, Penny Wise and Book Foolish. I have a copy of the Torch Press book. And I have Harry B. Smith's copy of Penny Wise and Book Foolish, which I acquired from Oak Knoll Books. For the record, I am a prospective purchaser of books, provided the books are in my price range. And I am a student of catalogues. 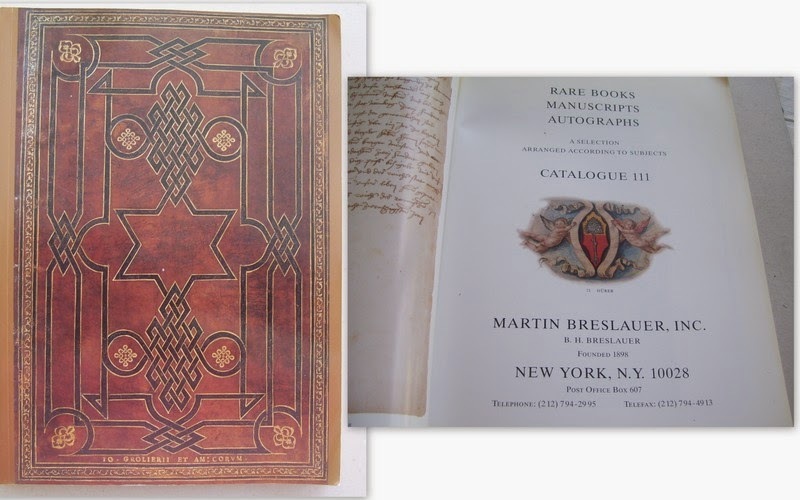 In My Sentimental Library blog post last month, I displayed bookseller catalogues issued by William Reese, Oak Knoll Books, and Martin Breslauer. I have more than a few catalogues issued by each of these three booksellers. If you like to study catalogues on Rare Americana, I recommend William Reese's catalogues. And if you are a prospective purchaser of his Rare Americana, I'm jealous. Most of the items are listed at four figures or more, and are just too rich for me. From 1989 on, I purchased a number of books about books listed in the catalogues of Oak Knoll Books, purchasing most of them before Bob Fleck's Oak Knoll Repricing Saga a few years ago. But I have gotten my money's worth of reading, studying, and researching not only the books I purchased, but the many catalogues I received as well. Several years ago, I purchased a case containing seventeen catalogues, which were issued by the firm of Martin Breslauer when it was located in London. The catalogues are numbered from No. 54 to 76, and are dated from 1941 to 1952. Reading the listings in these catalogues is a pleasurable experience. But then, the person who compiled them, Bernard H. Breslauer, was a published poet. My favorite Breslauer catalogue, "The Tenth Muse," is a catalogue within a catalogue –– it begins on page 38 of Catalogue Number Sixty. And it is a catalogue that collectors of literary forgeries would enjoy studying.
" THE TENTH MUSE, the crafty Muse of literary forgery," as Andrew Lang calls her in one of his essays, must have been an afterthought of the procreator of her nine fair sisters ; where there is original thought, a true work of art, representation of historical events, the plagiary, the fraudulent imitator, and the mystificator, will soon be at work. It is the last two that this collection of some 400 volumes which unfold a fascinating chapter in the story of the human mind is dedicated. We here mainly contemplate its darker recesses ; mercenary greed, misguided ambition, unhealthy pretension on one side, credulity, carelessness and stupidity on the other––enough material to satisfy a Swiftian taste in human frailty, and the curiosity of the modern psychopathologist. But the scholar and the book-lover are not being conducted on a tour of unrelieved grimness through a gallery of literary deformities ; they will meet the bright flash of genius, literary masterpieces in convincing disguise, and the edifying spectacle of the greatest in the realm of knowledge being hoaxed by what, in retrospect, often appear to be the fabrication of pigmies. Nor must we omit to pay tribute to the ever-watchful eye of scholarship which, even if temporarily blinded, has always espied treachery in the end, saving her domain from impurity and disgrace, and the incursion of the trespasser. In assembling this collection over a period of years (for much of the material he could only come by after patient waiting and constant vigilance) the collector had one purpose in mind : the critical study of the forger's ever-varying methods, the foundation of a veritable literary criminology which could be instrumental in the discovery and the exposure of other fabrications. For this purpose the most revealing cases were selected ; the inclusion of works appeared to be justified if they had, at one time or another, been seriously suspected by responsible critics, and the presence of a publication, with the critical material appertaining to it, does not in all cases mean that it is in fact a forgery ; for these and other reasons it is impossible for us to guarantee the "authenticity" of forgeries. We feel that in every library whether public or private, a shelf should be reserved for these ficticious productions, which would combine the attributes of a literary "Enfer" and a cabinet of distorting mirrors. The collection offered in the following pages will provide an abundance of material such as will not easily be found again. The compiler of the catalogue has attempted a classification which as he is himself aware is by no means watertight, but may he hopes, serve its purpose ; titles have been arranged under their true, and not their pretended authors, and in chronological order of publication. And here is an image of the catalogue's table of contents. 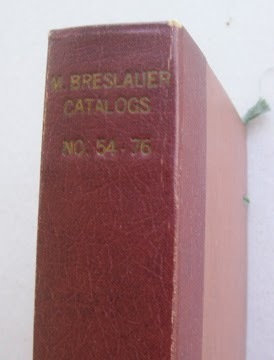 I have added two catalogues to my collection of Breslauer Catalogues. The first one is what I would call "a hurt book." 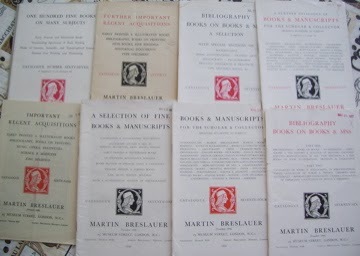 Martin Breslauer (1871-1940) was an internationally renowned bookseller in Berlin. He opened his bookshop in 1898. He moved to London in 1937 to escape from the Nazis. In October 1940, he suffered a fatal heart attack during The Blitz after a direct hit near where he lived. At that time, his son, Bernard H. Breslauer (1918-2004), was interned with other Germans on the Isle of Mann, but was released shortly after his father's death. Bernard Breslauer took over the family business, but kept it in his father's name. He issued Catalogue Number 53 under a Stamford Court address, most likely in early 1941, the same year he issued Catalogue Number 54. He remained in London until 1977, at which time he relocated the business to New York City. The second catalogue I added to my collection may well be the last catalogue Bernard Breslauer issued: Catalogue No. 111, issued in either 1993 or 1994. The front cover displays a Grolier binding by Jean Picard, item 93 in the catalogue, which is listed for a mere $280,000. I have more than a few catalogues compiled by other booksellers to show you in my Flickr slideshow, A Selection of Bookseller Catalogues.